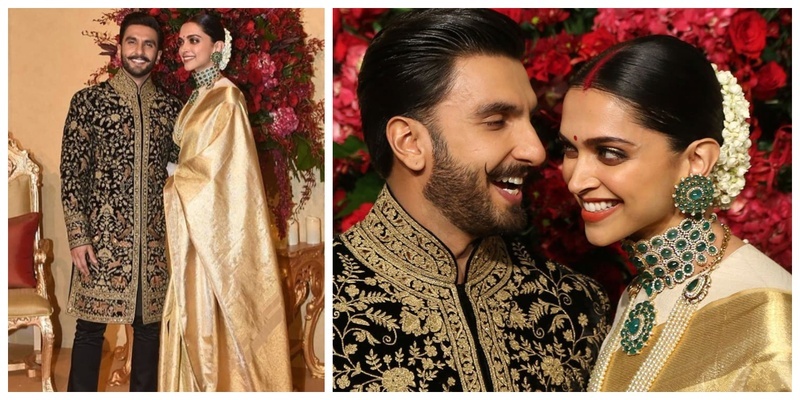 All the exclusive pics & deets from Deepika Padukone and Ranveer Singh's Bangalore reception! Deepika Padukone’s Bangalore reception that took place at The Leela tonight was much awaited and here’s saying it was WORTH THE WAIT. The reception started with a bang with the star couple themselves sharing a picture from the starry night and exuded some major #RegalVibes. Deepika Padukone chose to wear a golden saree from Angadi Galleria which was a gift from her mother, Ujjala Padukone. She paired her saree with a high neck blouse with full sleeves bringing out a balance to her jazzy look. She completed her look with a statement emerald choker and earring set, layered with a pearl rani haar and looked breathtaking. Ranveer Singh chose to wear a black and gold Rohit Bal sherwani with the golden work complementing Deepika’s look. Although what caught my attention were those statement shoes. Badminton champ PV Sindhu was one of the first guests to arrive at Deepika and Ranveer's Bengaluru reception. She looked gorgeous in an Anamika Khanna attire. Anil Kumble was also photographed arriving with wife Chethana. Well well, with the Bangalore reception like this, can't wait for the Mumbai reception!